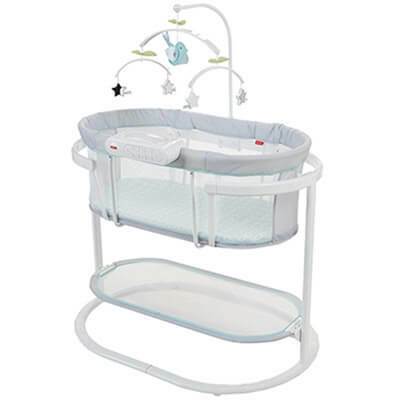 Best-selling sturdy all-in-one bedside bassinet. High-quality co-sleep solution for any concerned parent. Compact & comfortable place to sleep for your baby. High-end bassinet helps your baby to relax and sleep peacefully. Features soothing music & sounds, gentle swaying and more. Do You Need a Bassinet? When Do Babies Use a Bassinet? What’s The Difference Between a Crib and a Bassinet? Are you preparing to bring your new baby home? It’s such an exciting time in your life! Parents have to get everything ready that their baby will need, and a baby bassinet is one baby item you get. The best baby bassinet gives babies a safe, snuggly sleeping environment while close to mom and dad. We understand how hard it is to pick the right bassinet for your new baby! Safe sleep is something all parents should be concerned about, and you also want your baby to be comfortable. A comfortable baby should sleep well, at least that’s your hope! 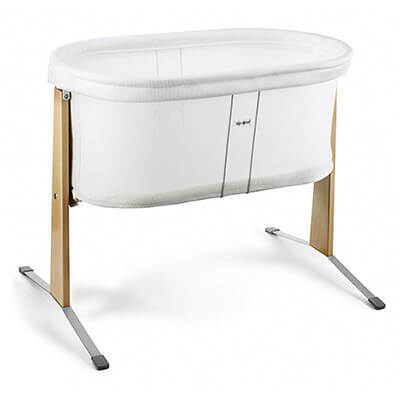 The Halo Swivel is an all-in-one bedside bassinet with tons of useful features. It’s more expensive compared to other options, but you’ll find that it’s worth the money. Halo crafted a bassinet with quality materials and craftsmanship. It is a unique design. Parents can adjust to fit your bed height, making it suitable for all beds. Sheer mesh sides provide visibility and breathability. We are impressed with the build quality; it truly will last through multiple children. In fact, the CJ Foundation certified the Halo as the safest alternative to bed-sharing to reduce SIDS! That’s impressive! Comfort, for mom and baby, is where the Halo Swivel stands out. Moms love the retractable walls, the bedside positioning, and the adjustable stand. 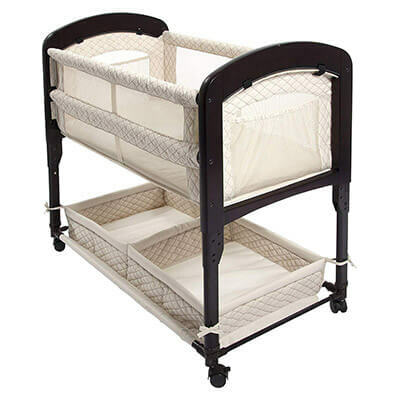 You can tuck the base under your bed and lower the wall to get baby out of the bassinet. It’s one of the best choices for c-section recoveries because the entire bassinet can swing over the parent bed. Did we forget that it adjusts from 24” to 34” tall? That’s amazing! Halo has a decent weight limit of 20 lbs and under. You either stop using it then or when your baby can roll over. If you want a bassinet that moves from room to room, the Halo won’t be an ideal choice. It’s sturdy and heavy. Pockets on the sides give you a place to store diapers and wipes for middle-of-the-night changes. If you opt for the Premiere Halo Bassinet, it comes with music, a timer, vibrations, a nightlight, and nature sounds. It’s not too much more money and might be worth it for the extras! Overall, the Halo may not be the best choice if you are on a budget or want something that moveable. We think it’s better for families who want to have baby closeby and mothers who have c-section recoveries. Some people prefer a co-sleeping bassinet that they can attach to their bed for easy middle-of-the-night feedings. Arm’s Reach is known for their collection of different co-sleepers, and their Cambria is a beautiful, elegant choice for parents. It’s our pick for the best co-sleeping bassinet, allowing parents to sleep with their baby on a separate surface. One of the first things you would notice if you set up the Cambria is that it’s sturdy. The sides are wood. The sides are all mesh, so you can always see your baby and provides plenty of ventilation. The mattress is thin, but not too uncomfortable for babies. For moms, Arm’s Reach is meant to attach to your mattress, creating a seamless (and safe) transition from your bed to the co-sleeper. If the Cambria doesn’t line up with your mattress, Arm’s Reach does sell leg extensions. We found that raising and lowering the side of co-sleeper was very easy. Arm’s Reach states that the Cambria can be used for babies 5 months of age or when the baby starts to push up on his hands and knees. The Cambria has wheels, so moving it from room to room, if you want, is quite easy. Folding it up for traveling isn’t as easy as other choices. It may not be the best choice for a traveling bassinet. Under the co-sleeper, you’ll find convenient storage bins. These bins are perfect for storing extra diapers, wipes, blankets, and anything you will need for sleeping. The Cambria is a great pick if you want a co-sleeper that attaches to the side of your bed. Nursing mothers, in particular, find this style of bassinets helpful. However, it is pricey for the lack of features that you receive. The overall and elegance of the bassinet make it appealing to many parents. Babies need a place to sleep when you’re on the go, whether you’re heading to grandma’s house for dinner or traveling to the beach. The Chicco LullaGo is our pick for the best portable bassinet due to its convenient setup and safety features. Let’s take a look at what the LullaGo offers. Chicco added mesh windows for breathability and ventilation. 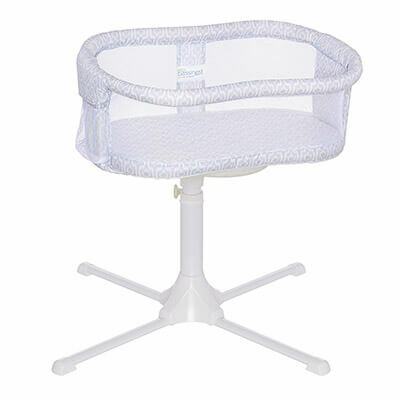 The anti-slip grip on the feet of the bassinet prevents it from sliding around. The bassinet attaches to a sturdy frame, so you never have to worry about it collapsing. We do love that Chicco used high-quality materials. Those fabrics are soft and easy to wipe clean, but you can also remove all of the fabric of machine washing. Your baby will love the large, padded mattress that comes with a zip-off pad for machine washing. Unfortunately, when compared to other mattresses, it’s not the most comfortable option. We should point out that the AAP does recommend a firm mattress to reduce SIDS. LullaGo can be used from birth to 20 pounds. If your child starts to push up on his hands and knees before he reaches 20 pounds, it’s time to discontinue use. Portability is where LullaGo shines. Set up takes a few seconds because of the easy-to-use snap-on legs and one-piece top structure. Chicco included a carrying bag for storage and travel purposes. The bag is large and easy to get the bassinet; no struggling for you! Chicco sends a set of sheets with the bassinet, but those sheets left a lot to be desired. They are rough and not waterproof, so not the best choice for a newborn baby. However, you can purchase replacement sheets, which is what we would suggest you do. Overall, the LullaGo has a fantastic, lightweight design that makes it a contender if you want a portable bassinet, Chicco LullaGo is a great choice! You won’t get all of the fancy features, but your baby will sleep comfortable and content. BabyBjorn makes high-quality baby gear, and their Cradle is no exception. We know the price is high and not in the budget for many, but the features make it a worthy choice for our list. The gentle rocking movements will lull your baby to sleep, and it’s simple, classic design will blend in with any decor. It looks like a stylish piece of furniture rather than a baby bassinet! For safety, BabyBjorn added breathable, mesh sides for generous airflow. The low heights of the walls also provide excellent sightlines for parents. We like the durable foot grips that keep the Cradle sturdy wherever you place it. Plus, the entire Cradle is constructed from fabric without any bars or loose parts. Plus, it’s worth noting that the Cradle is JPMA certified and uses Oeko-Tex Standard fabrics that are free of any health-hazardous substances. We love that the materials are all safe and tested! We believe comfort is where the BabyBjorn Cradle stands out. This compact cradle soothes your baby to sleep with gentle rocking motions. Parents can rock the cradle themselves, or the baby’s movements will cause the cradle to move back and forth. BabyBjorn uses a spring suspension system for consistent, gliding motions. BabyBjorn recommends that parents stop using the Cradle when the baby is six months old or at 18 lbs, whichever comes first. If your baby can sit up, kneel, or stand unaided before six months or 18 lbs, it’s time to discontinue use! At first glance, you might not think that the Cradle is lightweight, but you’ll be surprised to know it only weighs 13 lbs! You can carry it anywhere in the house, keeping your baby close. Unfortunately, it doesn’t fold up and act like a portable bassinet. Parents can opt to purchase extra accessories, such as a canopy and fitted sheets. Unfortunately, the BabyBjorn doesn’t come with lots of bells and whistles when compared to other picks. With the BabyBjorn Cradle, parents get something more natural. The suspension system creates a gentle glide and the height fits perfectly against a normal adult-height bed. So, what’s the problem? The price is steep, and many parents can’t afford to pay for it. If you can, you will love it. Sleep is important for your baby’s development, and Fisher-Price knows that. Their Soothing Motions bassinet gives many ways to soothe your baby back to sleep. Babies love the gentle swaying and mesmerizing lighting options. The Fisher-Price bassinet gives your baby everything necessary to get a good night’s rest. All of the walls of the bassinet are mesh for ventilation. The bars are outside of the bassinet, so your baby won’t hurt himself. It has a wide base to prevent tipping over. There is also a lock to minimize rocking. One of the only downfalls we see is that the height of the bassinet is about 23” from the floor to the top rail. That means, for most beds, it can pull up right beside your adult bed. However, the mattress is about 10” lower than the railing, so if you have it close to your bed, a pillow could fall over onto your baby. We suggest that you keep it a foot or two away from your bed for safety purposes. 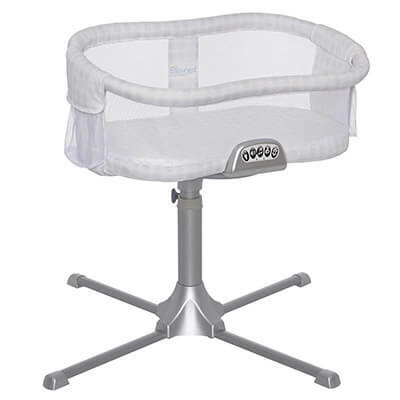 The Soothing Motions Bassinet excels at comfort for your baby. There are several ways to lull your baby to sleep, such as gentle swaying, two lighting options, an overhead mobile with twinkling stars, and relaxing vibrations, music, and sounds. One thing to note is that when the bassinet rocks, it doesn’t tilt the sleeping surface, so your baby doesn’t move from side to side. Fisher-Price has one of the highest weight limits of 40 lbs! You still will need to discontinue use once your child can get up on his knees. Fisher-Price added wheels, so you can move it from room to room as you want. It isn’t as portable or easy to fold as other picks though. We do love the wheels though! They make it easy to slide the bassinet over to the bed in the middle of the night. You will receive one set of sheets with your new bassinet if you pick this one. However, finding extra ones is rather tricky, which is a downfall because we all know how messy babies can be! Overall, we love the Soothing Motions! It adds all of those features that babies love about swings into a safe sleeping environment. Remember that swings are NOT considered safe sleep for babies, but this Soothing Motions Bassinet is safe for your child. Some parents use a crib from the start, but a bassinet offers different benefits. The American Academy of Pediatrics recommends that parents room share with their babies for the first six months to one year to reduce the risk of SIDS. A bassinet makes middle-of-the-night nursing sessions easier because you can just reach over and pick up your baby. Aside from being convenient, a bassinet makes recovering from delivery easier, especially for c-section mothers. Some mothers find that it’s easier to sleep when they can reach over and touch their baby. If you can’t afford a crib just yet, a bassinet is a cheaper option while you save up. Provides a safe sleeping environment while at caregivers. Ideal if you are recovering from back issues from childbirth or a c-section. Bassinets are designed for the newborn stage, and your baby can continue to use one until he is able to roll over or move around. Most babies stop using the bassinet between three and five months old. Certain bassinets have weight restrictions as well, so there is a chance your baby might have to stop using it before his starts to roll. Bassinets are basically scaled-down versions of a crib. Your baby can safely sleep in a bassinet, but they are lighter, more portable, and less expensive. Bassinets are typically not as tall as cribs either. Many moms like bassinets because they allow you to keep a better eye on your new baby. SIDS is scary, and you can sleep knowing your baby is safe and sleeping within arm’s distance! You can also move the bassinet from room to room, so you can keep an eye on your baby when you are making lunch, paying bills, or watching a movie. Remember: Bassinets are AWESOME, but they aren’t a permanent replacement for cribs. Cribs are roomier, and your baby is growing! As he gets older, he will need more space. The walls are lower, so babies can topple out of a bassinet if used for too long. Picking the right bassinet does require a bit of thought ahead of time. It’s not a good idea just to pick one without doing any research at all. Don’t base your decision off what the bassinet looks like. 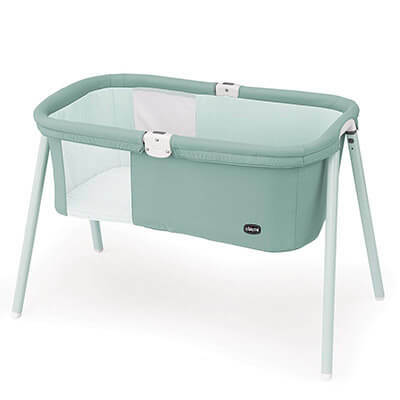 We understand; you want your baby’s bassinet to look nice, and we agree! To pick the top 5 best baby bassinets, we used these criteria. Safety is of utmost importance. Bassinets aren’t as big as a crib, so your child doesn’t have as much space to roll around or spread out. If your baby does manage to roll over, you want the sides to have mesh. Breathing is harder against the thick fabric. Mesh walls also increase airflow, keeping your baby at the right temperature. Check to see if the bassinet you selected meets safety standards! All of the bassinets on this list do. That means that they have to follow standards set by the ASTM and undergo third-party testing. When we talk about comfort, we think about comfort for mom and baby. First, it should come with a thin, hard mattress. You’re probably thinking that doesn’t sound too comfortable! However, the AAP does recommend that babies sleep on a firm, thin mattress to reduce the risk of SIDS. For mom, how will it act in the middle of the night? Can mom reach the baby easily from bed? Is it adjustable? These are the things we considered because we know how hard it is in the middle of the night to get up! Make sure you don’t select a bassinet that has a really low weight limit. Ideally, don’t select anything below 15 pounds, especially if you’re still pregnant right now. You might have a 10-pound baby and not get much use out of it! You should also look at when the manufacturer recommends that you stop using the bassinet. Some recommend around six months, but other says as soon as the baby can roll over, which can happy around 8 to 12 weeks for some babies! Bassinets, due to their nature, are more portable than cribs. You don’t typically take down a crib to head to grandma’s house. Some bassinets are easier to move around than others. Ideally, the bassinet will have wheels and be very lightweight. If you travel a lot, you might prefer a bassinet that can fold up and be placed in a traveling bag. Those are great for vacations or even picnics! Not all bassinets have that requirement though. All bassinets come with something different or nothing at all. That’s what we look at in this criteria. Hopefully, the company included a set of sheets because sometimes, it can be hard to find sheets to fit your particular bassinet. Some are odd shaped! Other bassinets rock, glide, vibrate and come with options for sounds and music. You might like a bassinet that has an overhead mobile. All of these are considered extra features. They are nice but not every company includes them in their bassinet. If it’s crucial for you to have these features, pay attention to their descriptions. Bassinets are far from a true necessity, but having a baby isn’t easy. Those first few weeks, whether it’s your first or fourth, are tiring. You are sore and need to rest, and having your baby close by in a bassinet is ideal. The AAP does recommend that parents roomshare for, at least, six months to reduce SIDS. 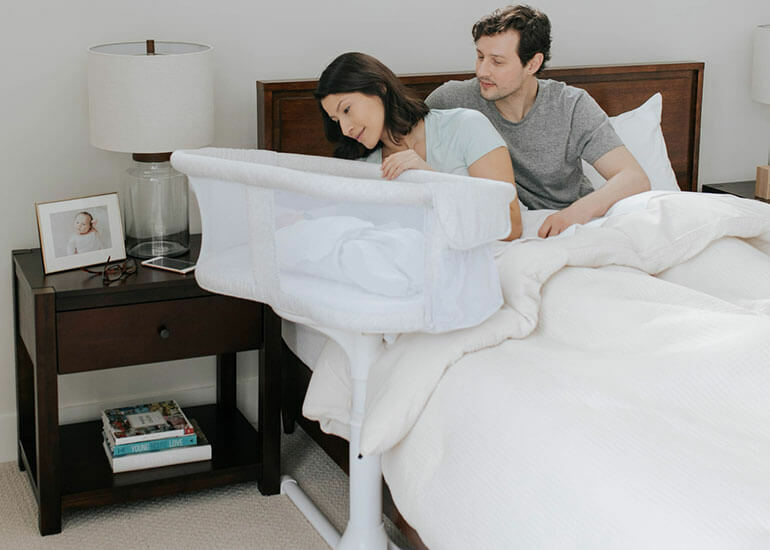 A bassinet makes room sharing and keeping an eye on your new bundle of joy much easier!